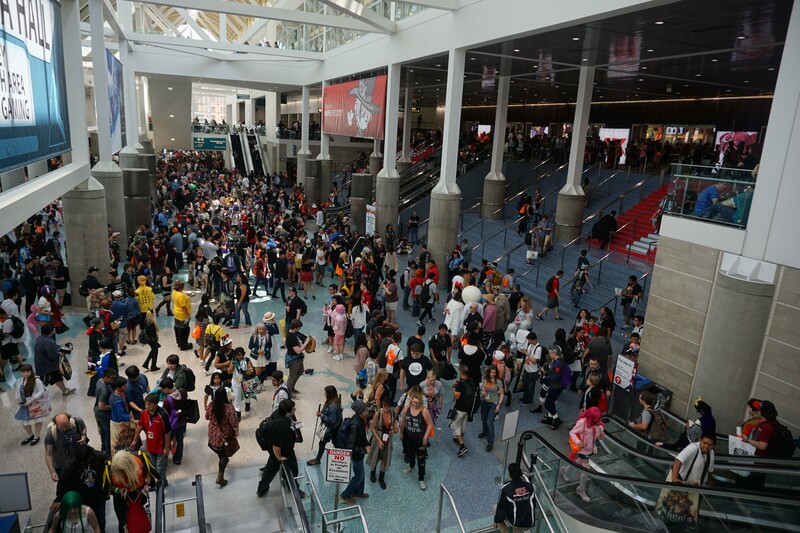 Another Anime Expo has come and gone, and now it’s time to reflect back on the weekend in all its glory and despair. While I don’t regret going this year, there are several areas where I hope for improvement for the future. Below is the schedule I ended up following, a much shorter version than the one I created at the start of the convention. Feel free to also use the jump links to read the sections that most interest you. 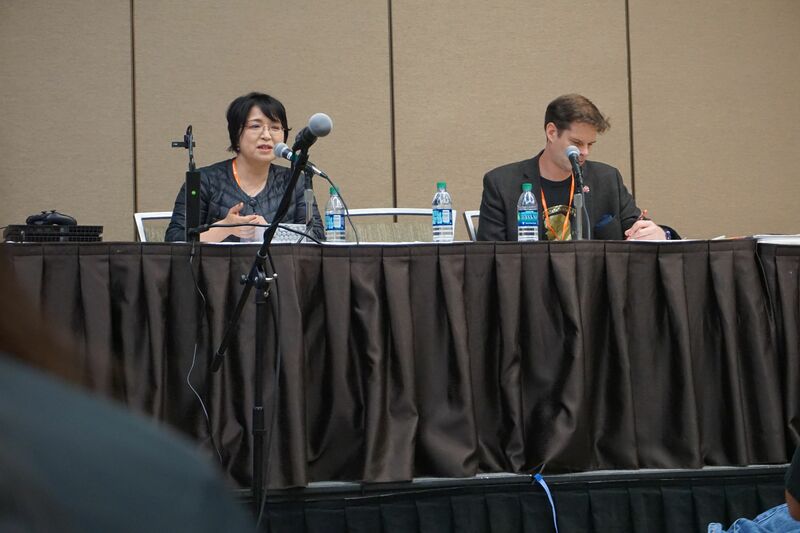 Q&A with Fujino Omori author of Is It Wrong to Try to Pick Up Girls in a Dungeon? 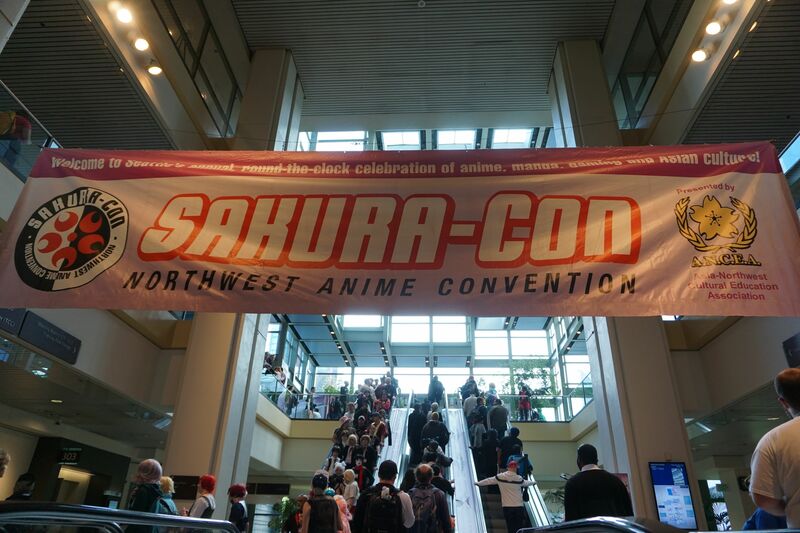 This year’s Sakura-Con marked its 20th-year anniversary, a milestone I am thrilled to have been a part of. 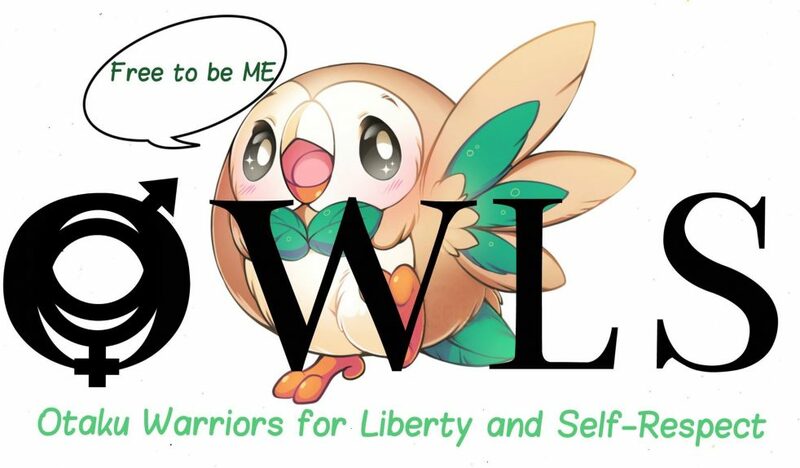 I am eternally grateful to live in a city that hosts conventions of this nature, particularly one that claims the title of the largest anime convention in Northwest United States. While the anniversary was brought up a few times during the convention, I don’t feel like it was highlighted overly much. Perhaps there were more festivities marking the occasion in the evening, but I never stay around long after the Exhibition Hall closes. I attended with my husband as usual, as well as with draggle who was visiting the area. Experiencing conventions with friends is a large part of what makes them so enjoyable for me. While I would certainly still attend by myself, there’s a priceless feeling when sharing those same moments with the people you care about. I also bumped into several Twitter folk, many of whom seem to like coming to Seattle–that makes them cooler in my book! To those of you I saw, it was great meeting you! As usual, I’ll break up this post into the below sections. While I attended multiple Japanese guest panels, I decided to dedicate individual blog posts for those transcriptions instead of compiling them here. Please be sure to check them out! 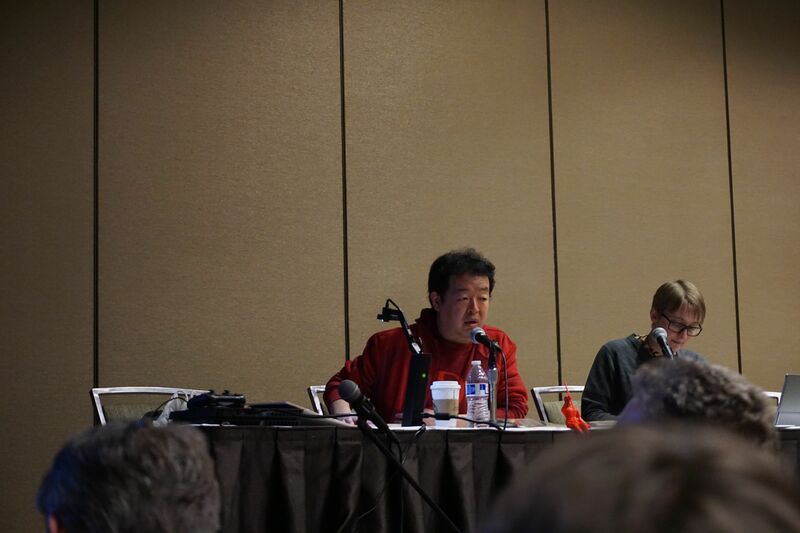 This second panel focused on Hiroshi Nagahama’s upcoming work with Stan Lee, The Reflection. After attending his impassioned discussion on American comics in his first panel, I was excited to see how this second one would proceed. Instead of a projector, large posters for the new series stood on panels in front of the guest table. Promotional videos for DEEN and The Reflection appeared on the large side screen. 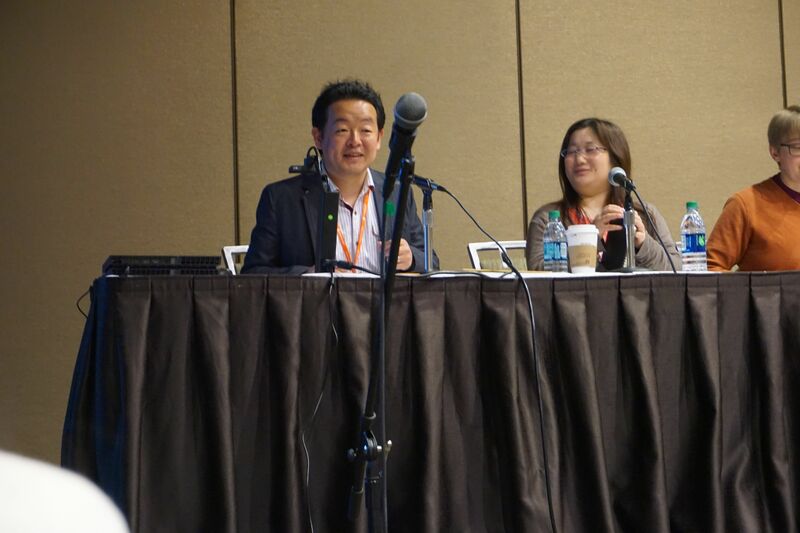 Nagahama-san returned with his excited tone of voice to discuss behind the scenes details for the series. I’ll be honest and admit that I am not the biggest fan of American comics. While I do enjoy the occasional U.S. film, I find the flood of superhero movies a bit overwhelming. I wasn’t too keen on the idea of an anime posturing as an American comic, but Nagahama-san convinced me otherwise. After listening to him, I am now looking forward to trying The Reflection. I don’t think I would have felt this way if I had not seen and listened to him in person, so thank you, Sakura-Con, for inviting him! I’m really loving these live sketches! They allow the guest to further elaborate on their discussions and show a bit of playfulness. Slightly different from the other two live sketch panels, Sonoda-san requested questions involving some type of visual he could draw while answering the question. Similar to my reaction to Shiki Douji, Kenichi Sonoda’s appearance surprised me a bit since most of his more famous works aired in the 80s and 90s. Of his anime, I am familiar only with Bubblegum Crisis. He is also well known for Gunsmith Cats, Otaku no Video, Riding Bean, and Gall Force. 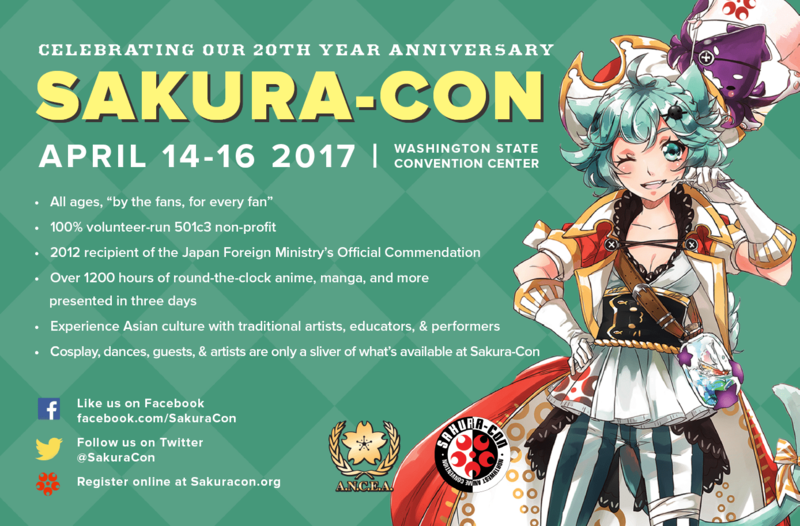 I was frankly surprised to see Shiki Douji listed as a guest at this year’s Sakura-Con, given that Full Metal Panic! last aired with a sequel in 2006. However, upon further research, I see now that there is a new work coming out later this fall. 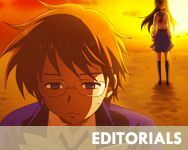 I feel that the convention could have promoted this new work a bit more, or at least should have highlighted Shiki Douji’s appearance more so old fans and possible new fans could unite at her panels. 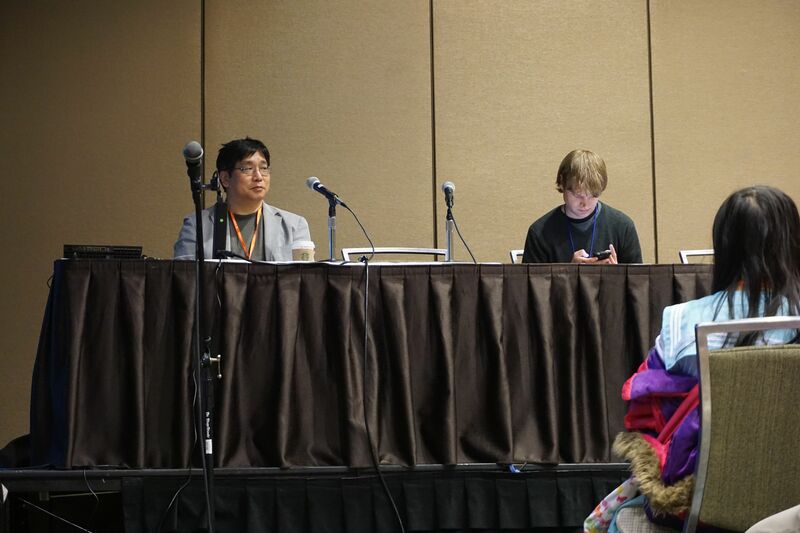 Then again, I was unable to sit in on her first panel, so perhaps that drew a larger crowd than this second session. Douji-sensei was very sweet and took her time answering each person’s question. She saved her live drawing for the end, so was rushed for time during that segment. It was nostalgic remembering my love for the anime as I listened to her, and I’m excited to see the new show later this year. And yes, Fumoffu! is the best! Chikashi Kubota is perhaps most recently known for his character design and animation work on One-Punch Man, though I am personally more invested in his work on Shinsekai Yori. This was a straight Q&A, where audience members came up to the mic. I believe Kubota-san may have been one of the younger Japanese guests in attendance, and it was endearing seeing his exuberance in chatting with his American fans and describing his experiences in Seattle. As he works in animation, I would love to see him visit again and do some live drawing. I became a bit spoiled from the other panels that did this! Something new at this year’s Sakura-Con, and to any convention I have personally attended, was the live sketch format. For almost all past panels, the main format included some type of Q&A with lecturing, as well as the occasional promotional video or full screening. 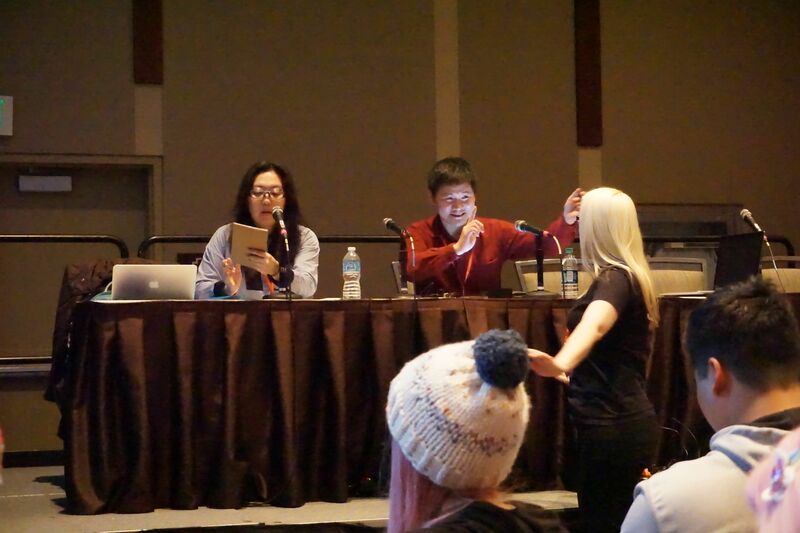 This live sketch Q&A involved Yasuhiro Irie having prepared live models from attendees in advance for him to draw while simultaneously answering questions from the audience. His ability to multi-task with rough sketching and talking set the bar high for future panels of this nature. He not only answered questions and directed the models, he also did so with a cheery demeanor that maintained a positive atmosphere for the session. 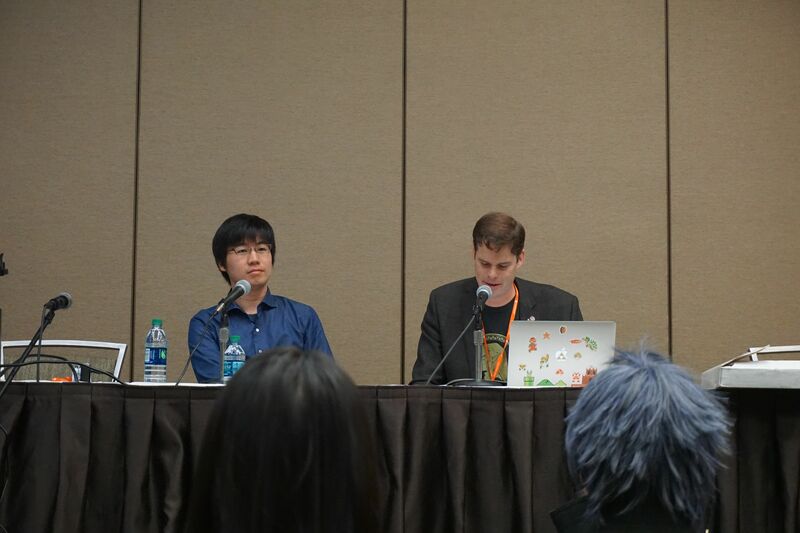 Kicking off my Sakura-Con panels for 2017 was “Hiroshi Nagahama and His Love for American Comics,” where Nagahama-san gushed on for the full hour, showing us classic American comics and figurines on the overhead projector. Nagahama-san is well known for his directing in shows like Mushishi, Detroit Metal City, and Aku no Hana, as well as his key animation in Fruits Basket (OP/ED), Revolutionary Girl Utena, and Birdy the Mighty (episode 1). In addition to discussing American comics, he also touched briefly on his upcoming work with Stan Lee, The Reflection. Despite the majority of the panel running in the style of a lecture, I greatly enjoyed witnessing his exuberance for the topic. His passion shone through his voice and gestures. He did answer a couple of questions at the end of the panel. If you enjoy this transcription, please be sure to come back and read my coverage of his panel on The Reflection. I typically prioritize Japanese guest panels since I appreciate their time and attention in flying over to the U.S. and sharing our enjoyment for their works. As a whole, the guests I’ve seen in past years of this convention have been engaging, with the exception of some translator and technical hiccups. I’m particularly excited this year for the handful of live sketches; this will be my first time experiencing this type of panel. Per usual, I will try to transcribe or summarize the panels I attend for you in my coverage later in the week. If you are attending, let me know what you’re most excited about! 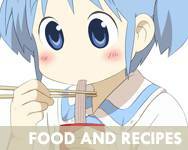 As a local, I’ll also be happy to provide any recommendations for food and activities in the area. 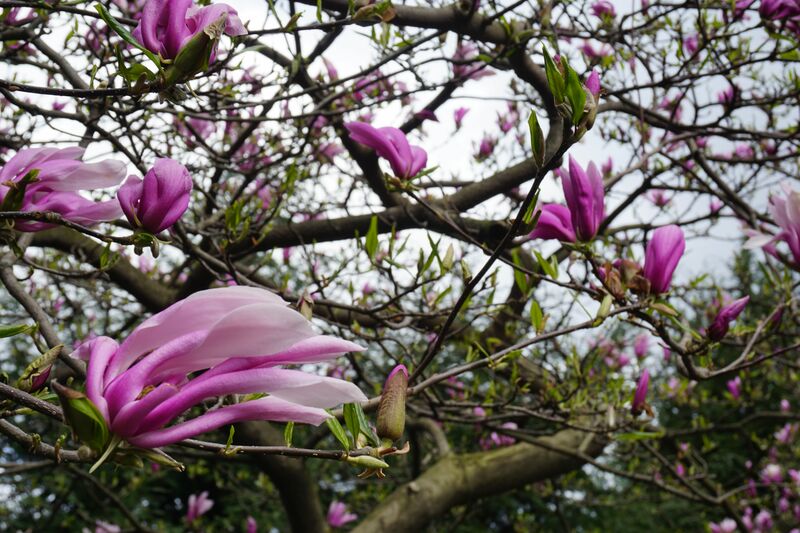 Every year, Sakura-Con is held during Easter weekend–a busy time of year that brings together a widely celebrated holiday, the ending of the anime winter season, and the beginning of the anime spring season. To add to the already hectic schedule, Seattle also hosted presidential candidate Bernie Sanders’ rally and the Washington State Democratic caucus. Somehow KWoo and I survived yet another year of the convention, bringing back with us a good handful of merchandise, plenty of cosplay pictures, and a few choice panel transcriptions. My Sakura-Con coverage this time around will be structured slightly different, particularly with the panels. In the past, I’ve varied between doing multi-day coverage and single-post coverage. I’ve decided to strike a balance between the two by discussing the general convention in this post, while dedicating individual posts to each of the guest panels whose discussions I transcribed. These more detailed panel posts are linked in this entry, as well.